Retired U.S. Air Force Major Robert Karwoski was born in Jersey City, New Jersey. Major Karwoski began his military career after receiving his commission through the Officer Training School, Lackland Air Force Base, Texas. 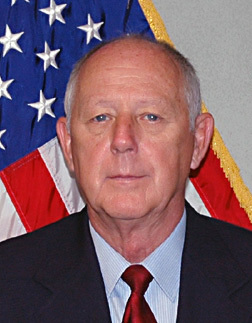 He served on active duty for twenty-two and a half years and following retirement, worked in the aerospace industry. He and his wife live in Madison. On 7 February 1970, Robert Karwoski distinguished himself while serving as a navigator on an AC-130 Gunship while flying a night reconnaissance mission against the Ho Chi Minh trail. On that date, his aircraft was engaged by extremely intense and accurate enemy anti-aircraft fire by which he was wounded. In spite of the heavy enemy fire, his aircraft destroyed eleven enemy supply vehicles containing a large amount of supplies and munitions. For his actions, Robert Karwoski received the Distinguished Flying Cross and the Purple Heart Medal for wounds received in action. On 30 December 1972, Robert Karowski again distinguished himself, this time while serving a radar navigator aboard a B-52 bomber aircraft flying a mission over North Vietnam. His quick reaction and accurate response to hostile enemy surface to air missile launches against his aircraft enabled his crew to deliver their ordnance directly on the enemy target. For his superb airmanship on that date, Robert Karwoski received the Distinguished Flying Cross.